Bernie Napp, the senior policy analyst from Straterra, attempted to dismiss comments from Green MP Julie Anne Genter, however the obvious duplicity revealed in his letter to the Southland Times is almost farcical. I would like to correct Green MP Julie Anne Center on her bizarre claim that no mining town in New Zealand has ever enjoyed benefits (Mataura split on mining benefits, January 25). In 2010 the New Zealand Insti- tute of Economic Research report- ed that the median wage for a mining employee, including in oil and gas, was $57,320 in 2008, compared to the New Zealand median of $33,530. It is wrong to use Waihi as an example of a mining town because people in that industry in Waihi also live at Waihi Beach, Katikati and elsewhere. Consider also the benefits to users of resources. As matters stand, New Zealand gas and coal are essential inputs into the dairy, wood and timber processing, horticulture and other industries. Indeed, if there were no energy and minerals, whether imported into or produced in New Zealand, there would be no hospi- tals, no transport, no schools, no electricity, no food, no clothing, no phones. Seen this way, the benefits of mining to society are infinite. It concerns me that someone writing on behalf of Straterra should attempt to misinform the Mataura people regarding the benefits of lignite mining. It is stated on Straterra’s own website that “We believe in engaging in a fair, reasonable and transparent way, to promote informed debate on resource sector issues”, yet Bernie Napp’s letter (January 26) was very misleading. For Mr Napp to imply that Waihi Beach and Katikati could be considered mining towns was a bit of a stretch when the obvious reason why some miners may choose to live in those places is because they would prefer not live in the actual mining town of Waihi. I challenge Mr Napp to name some prosperous New Zealand towns that have achieved average to above prosperity directly through mining coal or lignite. By exaggerating the incomes that could be expected from lignite mining by including those from the much wealthier gas and oil industries was very misleading. This would provide unreasonable expectations of the benefits of accessing one of the lowest grade energy sources in existence. Finally, it was disingenuous of Mr Napp to imply that opponents of the proposed lignite mining were against all mining. Our major concerns relate particularly to the mining of lignite and Solid Energy actively blocking public submissions. The lack of reasonable assurances regarding the capture of carbon emissions, the risks to water quality and the potential loss of over 3,000 hectares of productive farmland (that Solid Energy currently owns) are also concerns. Those who currently live close to the existing Newvale Mine suffer from constant noise and the bright lights at night and as the mines expand so will the number of people affected. Let’s have more honesty and transparency please. It makes it easier to understand the purpose behind Mr Napp's letter when you visit Straterra's website and read their statements regarding the supposed "climate change myths". I was surprised at Straterra's clumsy attempt at spinning lignite into something shinier. Perhaps Mr Napp is new to the position and hasn't yet mastered the art of propaganda writing. Anybody following the issue would have greeted Bernie's claims with a hearty guffaw, especially when reading his slippery handling of the statement by the Green MP. I'd not be surprised though, if Mr Napp was able to find some tiny one pub, 3 house town somewhere that has been able to give itself a lick of paint thanks to a nearby coal mine - remember, it's lignite we're focused on here, not anthracite - they are not one and the same and the returns from each are not equal. The campaigners (camp/campaigners - I'd not made the connection til now) at Mike Dunbars farm were there opposing the lignite mining proposals for Mataura, not all mining, as their opponents are fond of claiming. Lignite is not, as we were reminded by the mining employee who spoke about coal briquetting in Britain, coal. It is lignite and that's to the wood end of the solid fuel spectrum. Bernie used to run the media for the Department of Conservation and has been in the Straterra job for a year or so. I am intrigued by the responses. But - in the interests of debate - here goes. I recently drove through Reefton and was amazed at the new houses, and the new paint. The real comparison is to compare Reefton now, with what it used to be like. Westport is another town that has benefited from mining. But to centre on the key issue of concern, if we are really worried about lignite, and the climate change implications, surely, we as a nation should ban farming of all cows and sheep. "if we are really worried about lignite, and the climate change implications, surely, we as a nation should ban farming of all cows and sheep." Bernie, in your enthusiastic defense of mining you appear to forget that everything found underground isn't necessarily worth digging up. In Mataura's case the soil above the lignite has much better long term value than the lignite that supports it. Solid Energy has estimated around 50 years of useful productivity from the Mataura lignite which means following generations will lose the ongoing value of the land's food producing capability. It just doesn't make sound economic sense to me. Other than vested commercial interests I have yet to read any convincing research or scientific advice on the value of accessing the lignite. The technology to mine lignite cleanly and economically is not yet fully developed. If you are prepared to challenge Dr Jan Wright's report exposing the dangers of mining lignite currently, good luck to you, but you will damage the credibility of your organisation in doing so. Support for our campaign against the reckless mining of our lignite reserves has gone global. Jack Caldwell is a South African born GeoConsultant who is concerned about poor mining practices. When you combine his views with those of Australian farmer Sid Plant it is easy to see that there is some consistency in their stories. 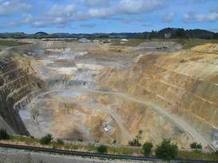 I cannot see Mataura being immune from the global realities of mining coal.